Join your experienced tour guide to gain a unique perspective on beautiful San Diego Bay on an adventure-filled, fast paced WaveRunner! 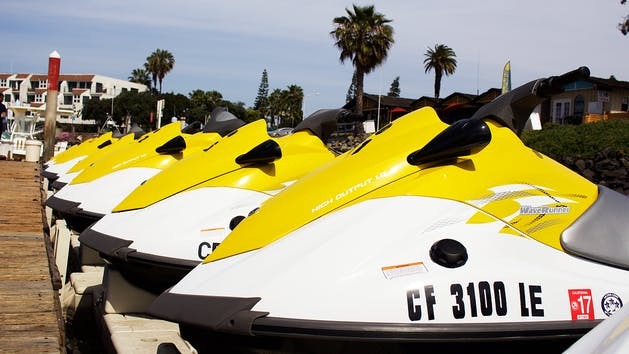 Departing from Coronado, you will zip around under the Coronado Bridge and up past Downtown, getting awesome views of the city, the Maritime Museum, and aircraft carriers while enjoying an adrenaline filled ride on our Jet Ski's. WaveRunners can accommodate 2 passengers. You must be at least 21 years old to rent the WaveRunner (physically give a deposit and fill out our contact.) Drivers must be at least 18 years old. Passengers must be old enough to sit behind the driver and tall enough that their feet touch the deck.